Despite massive security arrangements, violence was reported from several areas as Gorkha Janmukti Morcha (GJM) supporters torched, vandalised or forcibly shut state government offices on Monday -- Day One of its indefinite shutdown called to press for a Gorkhaland state in the northern West Bengal hills.While the GJM termed the shutdown "successful and spontaneous" and demanded central intervention on the Gorkhaland issue, the state government said the disruption was "suicidal". 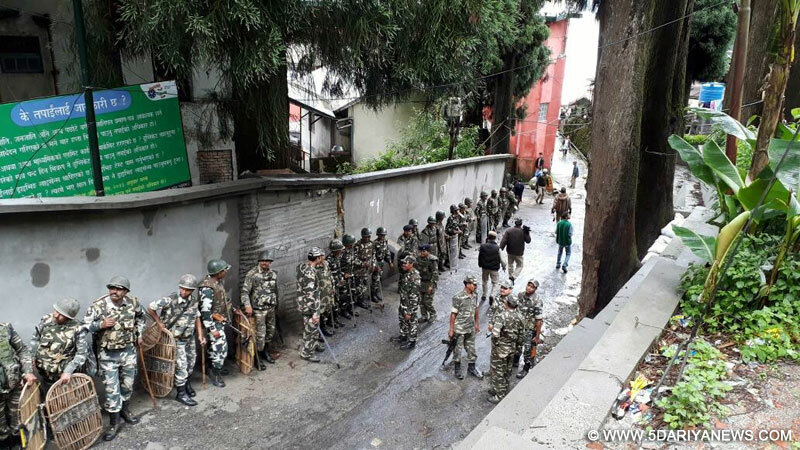 The police, however, claimed the situation was "peaceful".The shutdown call given by the GJM was mainly targeted at the central and state government offices of the hill development body, Gorkhaland Territorial Administration. Educational institutions and transport were kept outside its purview.The violence began early in the morning with the torching of Block Development Office (BDO) in Darjeeling's Bijanbari, allegedly by a group of GJM activists.Three GJM workers were arrested after the incident. "The situation is under control. Three persons have been arrested for trying to incite violence," a senior police officer said.In the afternoon, the PWD office in Darjeeling town was allegedly set on fire, while another BDO in Darjeeling district's Pulbazar was vandalised by pro-Gorkhaland activists. A hydro project in Sonada -- a small town around 17 km from Darjeeling -- was ransacked by the shutdown supporters, who also forcibly shut a panchayat office at Sukna.However, the police rushed in and reopened the panchayat office.The famous Toy Train service -- the Darjeeling Himalayan Railway, which figures on the Unesco Heritage list -- was kept shut considering the possible security threats to tourists, a railway official said. "There are no major incidents of violence but we are alert because there are many offices in the area. Our forces are patrolling and picketing everywhere," a senior district police officer said.The officer said the number of women police personnel had been significantly increased in the hills to "successfully tackle" the female protesters.To avert any ugly turn of events, massive security arrangements have been put in place at all important roads and public offices.Six columns of army have been deployed in Darjeeling, Kalimpong and Kurseong towns since Thursday, officials said.The state police, along with the CRPF and combat force personnel, were seen manning the important and critical points in Darjeeling, wearing protective body armour and helmets. "The shutdown is successful. It is a spontaneous shutdown. The people of the hills have made it a success," GJM General Secretary Roshan Giri told IANS.He said that the GJM had not staged any demonstrations in any of the hill districts, including Darjeeling and Kalimpong. "We didn't enforce a shutdown. We want central government's intervention and concrete steps on our long-pending demand for Gorkhaland," he said.Denying any role of the party in violence targeting government offices, Giri said: "Had we wanted, we could have stopped all offices by rallying our thousands of supporters. "State Tourism Minister Gautam Deb said the Chief Minister had instructed the state administration to "combat the shutdown". "This is a suicidal shutdown. Our government and particularly our Chief Minister Mamata Banerjee has instructed the administration to combat this illegal shutdown," Deb said.The minister said efforts are on to ferry thousands of stranded tourist out of the hills. "So far 45 buses, small, medium and large, have been operating to ferry stranded tourists to the plains in Siliguri and to the nearest airport (Bagdogra) and railway station (New Jalpaiguri). "There are still thousands of tourists there. We appeal to tourists not to panic, as we have stepped up security measures for them. Hotels and shops are still offering their services," Deb told IANS on Monday, but could not give approximate number of the stranded tourists.Besides pressing for Gorkhland, the GJM has accused the state government of "high-handedness and committing atrocities" on the people of hills.The party is also protesting what it calls the state government's "attempt" to impose Bengali on the Nepali-speaking people of the region, even though Chief Minister Mamata Banerjee has asserted there are no such plans for the hills.Although the party had on Saturday announced that tourism would be outside the ambit of the movement, a day later GJM chief Bimal Gurung "advised" tourists to leave the hills, saying the situation could deteriorate.